If you're looking for the best Mobile Billboards in the industry, Iconic Outdoor promises to deliver just that with a fleet of over 20 backlit vehicles ready to roll throughout the U.S.
Iconic Outdoor's fleet of Mobile Billboard Vehicles mostly consists of new trucks each with state-of-the-art backlit billboards approximately 10' x 22'. 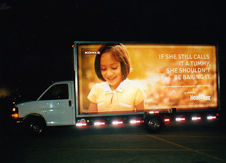 What else sets Iconic Outdoor apart from other Mobile Billboard companies? Your brand image is our top priority. The Mobile Billboards are kept clean, the signs are kept drum tight, and the drivers are trained to know each market and take pride in executing successful campaigns for our clients. Mobile Billboard Advertising is great for brand awareness campaigns, but also for your next convention, grand opening, product launch, recruiting event, you name it and our Mobile Billboards can promote it anywhere in the U.S.! We guarantee you will not find higher quality mobile billboard vehicles at any of the other "big name" companies. And you're also going to receive the most personal service possible. That's why we make ourselves available practically 24 hours a day, so if you need us we're here for you. Mobile Billboard Trucks on new backlit vehicles that take your message directly to your prospects anytime, anywhere in the U.S.
Professional Drivers who understand that the client's brand must be presented in an elite manner at all times. Customized Routes & Schedules either provided by our clients and/or developed by our in-house research team, so your campaign is always executed in the most efficient manner possible. We hate wasted impressions!